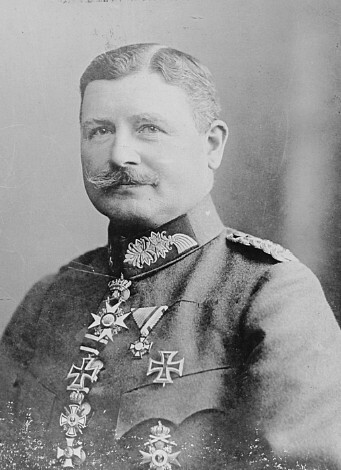 Groener, Wilhelm, b 22 November 1867 in Ludwigsburg, Württemberg, d 3 May 1939 in Bornstedt, Germany. German general; later a statesman in the Weimar Republic. The chief of staff of the German Supreme Army Command in Ukraine from March to December 1918, he was highly critical of the Central Rada and engineered Hetman Pavlo Skoropadsky’s coup d'état of 29 April 1918. He pursued the policy of exploiting Ukraine as an occupied country, extracting from it grain, other foodstuffs, and raw materials. At his insistence the Bluecoats and Graycoats, the Galician Sich Riflemen regiment, and other Ukrainian military formations were disarmed, and he further hindered the formation of Ukrainian military units. Later he was one of the founders of the Ukrainian Scientific Institute in Berlin and the first chairman of its board of trustees (1926–34). His memoirs were published in 1957.